Read rest of the review here. Awesome!! Many thanks iMav for this cool information.. 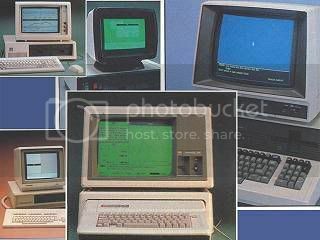 The various images of IBM PC compatible computers, including an Apple II with a PC emulator card, running Microsoft Windows. Obviously this was meant to imply and demonstrate that Windows, when released, would run on a variety of different hardware. My first desktop was running dos, had a 10mhz processor that could run at 20mhz in "Turbo" mode and a 10GB hard drive. I thought it was all the computer I would ever need to run Lotus 123, Word Perfect, and Pong! Its amazing what people thought about BEFORE WINDOWS EVER WAS INTRODUCED!! Thank you Imav for this gold article! Thanks for the share. Really awesome find iMav... It took me back in flashlight!